ACCIDENT, Md., Aug. 18, 2012 — In its fourth year, the annual 5K run and walk hosted by Cherry Glade Mennonite Church got faster. A lot faster. This year, Craig Bear ran about the same time as he did last year — less than four seconds slower, in fact — but the increased competition knocked him down 10 spots in the overall standings. Bear, 54, of Fort Hill, Pa., had to settle for 12th place overall among 102 5K runners. The fact didn’t seem to bother him, however, as he volunteered to lead the kids’ fun run afterwards — still in a good mood and a smile on his face. There was little time for smiling, however, for 20-year-old Jacob Beschner, of Sykesville. He start the 3.1-mile out-and-back course in a lead pack consisting of Cody Brenneman, Tom Ruckert and Jaron Hawkins. Less than a mile into the race — and up the first and only significant hill — Beschner established himself as the young man to beat. It stayed that way until the finish line, as Beschner stopped the clock in 17 minutes and 32 seconds — almost exactly two minutes faster than last year’s winning time (Adam Travis, 19:31.4). Meanwhile, Brenneman, Ruckert and Hawkins stayed together for a little while longer but Brenneman, 19, of Grantsville, pulled away to earn second place in 17:48. Ruckert, of Grantsville, who recently joined the Grand Masters division after his 60th birthday, held onto third in 18:39 while Hawkins, 29, of Frostburg, took fourth in 19:00. Eighteen-year-old Jocelyn Williams posted a time 80 seconds faster than last year’s top female. Williams, of Frostburg, crossed the finish line in 25:32, good for 38th place overall. In 2011, that time would have earned her a ninth-place finish — overall. Christine Carpenter, 16, of McHenry, followed up last year’s victory with a runner-up finish in 25:40. Monica Keller, 19, of Grantsville, placed third among women in 26:05. Proceeds from this year’s event benefited Phil and Debbie Workman, a couple who are known as “a backbone” to the Accident-area community. Phil Workman has experienced a series of medical setbacks since December 2011, including a four-way bypass. In February of this year, he was diagnosed with “B” cell Acute Lymphoblastic Leukemia and soon after began chemotherapy. Phil has been involved with the Deep Creek Volunteer Fire Company for 30 years, serving in numerous capacities. Debbie is the volunteer coordinator with Hospice of Garrett County Inc., and she volunteers with the American Cancer Society Relay for Life, Northern Rescue Squad Auxiliary and is president of the Deep Creek Volunteer Fire Department Auxiliary. ACCIDENT, Md., Aug. 27, 2011 — — Christine Carpenter arrived at Cherry Glade Mennonite Church on Saturday around 8 a.m. – far too early, she said, for the 5K race photographer to be taking her photo. The 15-year-old McHenry resident must have felt that 9:24 was a better time to be photographed. Carpenter crossed the finish line of the Cherry Glade 5K run in 24 minutes and 52.8 seconds to earn the women’s crown. She placed 14th overall among 98 runners and walkers. More than 110 runners and walkers from five states completed the 5K and 1-mile kids run, proceeds from which benefit Diane Beitzel. Beitzel was diagnosed in 1989 with Acute Transverse Myelitis and has been confined to a wheelchair ever since. She is now facing several new medical issues and will undergo additional testing in the near future. Proceeds are to help cover medical expenses and to make handicapped-accessible improvements to her home. The out-and-back course started on Accident Bittinger in front of Cherry Glade Mennonite Church, turned left onto Foxtown Road to the turnaround point on the relatively flat course and retraced their steps to the near the start. 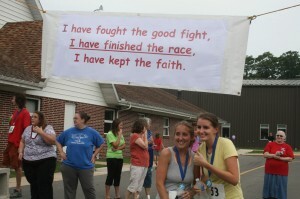 In the last 200 meters, runners turned into the church parking lot to cross the finish line. Carpenter outlasted Jolene Custer, 27, of Swanton, for the women’s title. Custer placed second with a time of 25:26.9. Cindi Long, 54, of Meyersdale, Pa., led a string of nine consecutive women to the finish line. Long took third in 28:46.8. Adam Travis was a last-minute replacement for Courtney Maust. Wearing her assigned Bib No. 29, the deal worked out just fine for the 18-year-old from Fowler, Mich. Travis bested runner-up Craig Baer by more than a minute and led all runners and walkers to the finish line with a time of 19:31.4. Baer, 53, of Fort Hill, Pa., was second in 20:36.7 and Seth Mast, 16, of Grantsville, was third in 20:59.1. The course for the kids’ mile run was likely short. The lack of distance, however, did not lessen the fun of it all. Tyrell Maust, 8, of Accident, had the fastest fun by taking the four-loop course around the church building in 6:46.2. Isaac Graber, 10, of Accident, took second in 6:53.7 and Ethan Tice, 6, of Grantsville, was third in 6:54. Sierra Maust, 11, of Accident, was the first female to cross the finish line. She stopped the clock in 7:17.1.